Welcome to the 373rd issue of the PC Improvement News. PCIN consists mainly of news and tips. There is something for everyone, and if this is your first issue, I'm sure there will be something for you. If you give me two or three issues, I know that you will come back for more! I finished the review of DVD to Pocket PC 3 this week. It is a cool product that just doesn't seem quite ready to be used. Read the Tips and Other Stuff section to learn more. I'll have a review of Battery Pack Pro done this week. Lastly, be sure to check out the two posts I made recently about Christmas. Fatal1ty and Vo0 stood on opposite sides of a darkened theater while an announcer boomed their introductions to an appreciative crowd. Their faces magnified on giant overhead monitors, the two stared straight ahead while artificial smoke swirled around them. They met at center stage and shook hands before starting what the announcer called their "grudge match." The victor of the match, which took place last month at the Nokia Theater in Times Square, left with $150,000, while the loser earned $100,000. Despite the size of the purse, the two rivals weren't athletes, at least not in the traditional sense. They call themselves "cyber-athletes" and their match, which was broadcast on MTV and followed online by thousands of fans, took place in a violent videogame called "Painkiller." The event, dubbed the World Tour Grand Finals, was one of 10 contests in nine countries organized by the Cyberathlete Professional League, or C.P.L. In the last year, the tour has given away $1 million in prize money. The C.P.L. is one of several leagues worldwide attempting to turn a popular pastime into a spectator sport. It's six hours before a performance of the new Cirque du Soleil show, "Corteo," and backstage, computers are controlling a series of dollies hanging from two giant arched tracks bridging the stage. Hanging from the dollies are three massive chandeliers from which acrobats are practicing gyrations and twists. The dollies are the kind of rigging gear seen in just about any circus or theater with acts that require people or props to be elevated far above the ground. But the system running the dollies' deployment--a crucial element of the show, since nearly every act involves one or more performers flying or leaping high into the air--is entirely automated, something that would have been unheard of to Cirque du Soleil's progenitors and that is rare even in some of the Cirque's other shows. Nearly a fifth of the US online buying population accounts for nearly half of total US online spending, research published today has revealed. Research firm Nielsen//NetRatings said that these buyers, dubbed 'Most Valuable Purchasers' (MVPs) spend more dollars online and make more purchases on the internet than the rest of the online buying population. If you happen to find yourself looking to remake your leftover Altoids tins, the company that makes the mints says the creative bar is a whole lot higher than an ashtray or a trinket box. Earlier this year, Altoids invited customers to enter its Tin Million Uses competition. The idea? Challenge people to come up with the most innovative way to reuse the ubiquitous tins.
" Over time, we've noticed that Altoids mint aficionados don't stop once the mints are gone," said Chris Peddy, general manager for Altoids. "They reuse their tins for anything from baking cookies to making musical instruments." After receiving nearly 200 entries, the company decided to award the $1,000 grand prize to Jon Lennon of Ithaca, N.Y., for the theremin--an electronic musical device whose pitch is determined from light--that he built inside a tin of ginger Altoids. Other top choices were Kenneth McCall's wintergreen tin that switches his music from PC speakers to headphones, Burt van der Klute's Morse code reader and Marcy Merill's pinhole camera. Last week I reviewed Adobe Photoshop Elements 4.0, a must have for amateur digital photographers. This week I will discuss white balance, how it will affect your photos, why it does, and how you can take advantage of this feature in your camera. Light as wee see is is typically white. That is because our brains are able to process the colours of the light and adjust what we see to what we are expecting to see. A good way to test this is to put on a pair colour tinted sunglasses. After a few minutes, the colour cast we saw when we first put the glasses on will have disappeared as your brain adjusts for what we know to be true colour. Unfortunately, film, and digital camera's cannot be so lucky. They see the colours as they are. The following photo shows very well how the colour of light can affect a photograph. When I looked at the scene, the street lights all appeared to be the same colour, but on the photograph, the colour of the lights were varied, orange, yellow and green. This is the colour shift due to the colour temperature of the lights. Morning light and late evening light is typically a warm light, while mid-afternoon light is usually cooler. Daylight is usually balanced to between 5000 and 5500 °K (degrees Kelvin). Light bulbs are usually warmer, producing a orange glow in a photo, while fluorescent tubes produce a green cast to the photo. With film, a variety of filters were needed (and a variety of films) in order to properly correct colour. Now though, digital cameras can adjust for white balance within the camera. 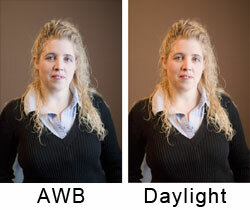 Most digital cameras will have an AWB setting (auto white balance) along with several other settings, usually daylight, incandescent, fluorescent, cloudy and sometimes there may be a few more options depending on your camera. By adjusting this setting for your light conditions you can get more closely match the colours of your scene with those of your photograph. There is something else you can do as well though. Try to change the colour balance in your camera to something other than what you are shooting for a different effect. The most useful change is to set your camera for cloudy conditions when shooting people in sunlight. This will warm the light a little, producing an effect much more like morning light, provide a slight tan for your subjects and overall make a more pleasing image. The image below I shot using window light filtered through white curtain. The Auto White Balance setting is on the left and is a little cool. (The camera determined the colour temperature was 4350 °K). I then adjusted the photo for daylight and the more pleasing image is on the right. This would be the same as shooting in daylight, and adjusting for cloudy conditions. Many cameras also have a method to adjust the white balance in your scene manually. Check your instruction manual for further instructions related to your particular camera. Next week I will discuss using a different aspect ratio on your final image. The digital photography tip of the week is written by the PCIN Assistant Editor, Chris Empey. Chris is a long time photographer and is currently the vice-president of the Niagara Falls Camera Club. You can see more of his photography at his Photo of the Day website. If you have a tip to send Chris, or a question about digital photography he can address in the newsletter, send it to chris@pcin.net. Gmail does not take dots in consideration. So if your address is myname@gmail.com, someone writes to my.name@gmail.com, or myna.me@gmail.com or m.y.n.a.m.e@gmail.com. All those mails will arrive in your mail box. Don't worry, this won't cause your mail to go another GMail user, because when you subscribe your GMail Account, Google verify that every combination with dots are not already taken. Very cool! Be sure to check out the other GMail Tips & Tricks by Bibear! If you've used Windows, then you've seen those errors. Well, I downloaded (it's freeware) and tried Unlocker, and it seemed to work just as advertised. It claims you can delete the index.dat files from the Temporary Internet Folder. It worked! I also was trying to delete a folder that Windows said was in use (even though it wasn't, and it worked! Of course, remember that Windows gives you these errors because it probably is being used by something. And terminating that program or unlocking the threads may cause problems, so you should be careful. But it is a cool utility! I would definitely recommend that you try the 30-day trial to see how it works for you before you purchase it. Many of the frustrations can probably be overcome, and I assume will be in future versions. Only time will tell. Recommend PCIN to others at http://PCIN.net/recommend.php and be entered in a monthly draw. Copyright 1998-2005, Graham Wing. All rights reserved.